Citizen preferences play a key role in a democracy, and there is a substantial body of work that tries to understand the role that public preferences play in the policy process. 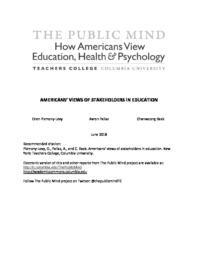 Despite the important role public opinion plays, there are only limited efforts to document public opinion about education, psychology, and health. The Public Mind project seeks to address this gap by providing reliable, valid public opinion data to inform public debate. The Project includes a series of public opinion surveys on a variety of issues related to governance, policies, and practice that have the potential to affect human development.